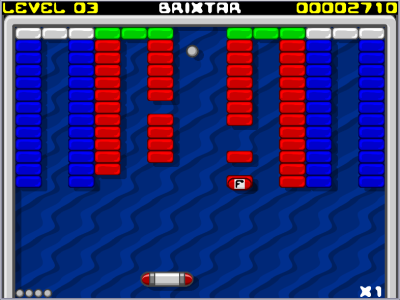 Brixtar is a simple Arkanoid/Breakout type game I made in 2007 as a test of some new game design techniques. As such, it is more of a tech demo than a completed game, however it does boast several levels and powerups. Use the mouse or keyboard for control, collect powerups and break all the bricks. This game is available in versions for Windows and Mac OS X. To install, simply download the zip file and extract the zip into whatever directory you wish. Download Brixtar for Mac OS X!